The 2D characters from the original Cave Story are making their way into Cave Story 3D. 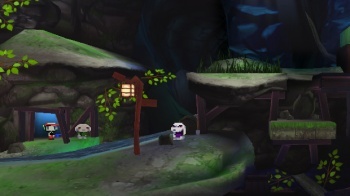 As seen here, the world of Cave Story 3D looks very different from the game's previous versions. However, it won't be totally unfamiliar thanks to a newly unveiled 2D sprite mode. Cave Story 3D is more of a remake than a port due to brand new 3D environments and character models. 2D sprite mode will replace those character models with sprites from the original game created by Daisuke Amaya for the PC in 2004. According to developer Nicalis's Tyrone Rodriguez, the mode will replace "literally every character and boss in the game." Cave Story's graphics have been altered once before for the WiiWare release of the title, upgrading the 2D sprites to a higher resolution. These are not being included, nor are 2D environments, due to hardware differences and the new engine used for the 3DS. What you get, going by the single screenshot available, is a strange combination of new and old. By strange, I mean strangely appealing, as if the game's characters took a trip through a dimensional portal. Retro throwbacks are always welcomed in my book.